WALLER, Texas — Barn finds. Usually they are old cars, motorcycles or airplanes, covered in dust echoing an era long gone. Auto racing fan David (Rusty) Schilder presented A.J. Foyt a barn find a bit more unusual—a unique painting by renowned Texas artist Charles (Bob) Wygant. The painting depicts Foyt leading the pack into Turn 1 at Indianapolis Motor Speedway. He is being hotly pursued by Eddie Sachs (12), fellow Texan Lloyd Ruby (5). The barn find was originally a gift to Schilder’s father, commercial artist Laurence (Hank) Schilder. Wygant worked with Schilder in a Houston art studio for many years. Wygant is famed for his Western landscapes. Wygant and the elder Schilder passed away (2008 and 2015 respectively) before the painting was discovered so the details of the artwork aren’t documented. Rusty Schilder remembers the story as Wygant doing it for fun since his commissioned paintings were focused on Western art. He presented the painting to Schilder’s father as a gift but the 4 foot by 8 foot painting was too large for Schilder’s office or home. Rusty recalls, “I was cleaning out my dad’s barn recently when I came across the painting sandwiched between a mattress and Tyvek foam wallboard. I recognized the lead car as belonging to Mr. Foyt and I knew he was still living so I thought he might like to have it. 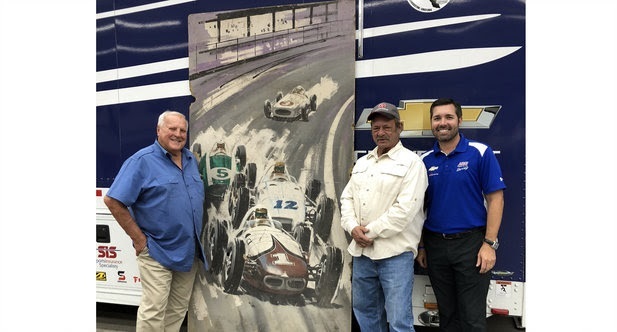 The painting appears to be from the 1961 Indianapolis 500, the race that launched one of the most iconic careers in motorsports and secured Foyt’s place in history. Foyt has not decided where the painting will be permanently displayed but for now it resides in the team’s headquarters in Waller.